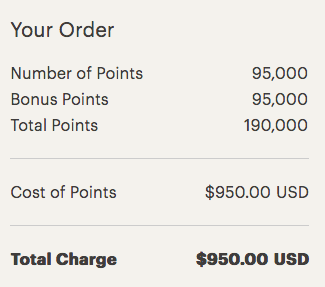 It's nice to see IHG once again offer up to a 100% bonus when buying points and for a longer period than time as that was only a three day flash sale. However everyone may not be offered 100% as this time the bonus is a mystery bonus which you have to log in to see. When I logged in I saw that I am being offered 100% and this is a good one to take advantage of if you get the same offer seeing that the new PointBreaks list will be released in less than two weeks. If you are offered 100% you can score IHG Rewards Club points for only half a US cent each. The maximum number points you can buy depends on if you have bought any yet this year. If you haven't then you can buy 100,000 points and get 100,000 bonus points on top of that. This 100% bonus from IHG is always a good way to score some stays for really cheap, especially if you are redeeming for a PointBreaks hotel!